Long-term Machin collectors - especially members of the Modern British Philatelic Circle - will be aware that a number of forgeries have been prepared over the years, from the early and poor-quality 24p brown, through to modern 1st class (or even £1) stamps. It must be improving print technology and lower prices for equipment and materials has led to a proliferation of quite good-quality forgeries of the 1st class red with security features! The one thing that eludes all the forgers is to properly reproduce the phosphorescent ink. Quite often these forgeries pass through the mail system without difficulty, but I have now been shown an example which was picked up by the automatic sorting equipment, and not cancelled. Upon examination it was first cancelled with the wavy line handstamp now (not often enough) used instead of the good old ball-point pen, and then the stamp was identified as a wrong 'un. I've not seen this COUNTERFEIT STAMP handstamp before. Being unpaid, the new £2 standard charge for an unpaid letter was raised, with the yellow sticker applied. I don't know how old this is. The stamp coding is MTIL M13L which means it could be nearly 4 years old - or it could have been used late last year. UPDATE: Rob has identified the competition (correctly) from the limited amount of address shown; it was published on August 28 2016, so the entry would have been posted within a few days of that date. I work as a sorter in Kent and have not heard tell of these Machin forgeries until now. In mid December we had a batch of forgeries but they were English £1.33 on outgoing foreign mail. It was odd that the crooks chose to forge such stamps as English stamps are not at all common on the mail we see. You get to sense things after a while and these ones looked creamish rather than the real ones' whitish hue. I have also seen fake 'UK Postage' stamps recently. They are completely bogus: a picture of the London South Bank, ferris wheel and all, no queen's head eother. We were told they are sold in 'corner shops in Canterbury and Brightonand that students are using them unwittingly, but students are supposed to be clever aren't yhey? Hello Anon from Kent, and thanks for your contribution. There have been at least 8 different types of 1st class red forgeries, plus the 1st class Olympics and the 1st Diamond blue stamps, and the older 1st class gold - see other entries in this blog: http://blog.norphil.co.uk/search?q=forgery Whilst many can be easily identified (especially on dark envelopes) by the perforations, many others are very good copies. The main reason why you probably don't see them is that the intelligent letter sorting machines (iLSM) and Intergrated Mail Processors (IMP) will detect that there is no phosphor on them, and sidetrack them to Revenue Protection. These should also be turfed out by the sorting machine so that revenue protection can pass them on to Universal Mail for onward transmission to the country of destination. It might be an idea to talk to your manager about these so that you and your colleagues will know what they are in future and ensure that they are dealt with properly. I stopped working as a delivery postman before they started otherwise I could tell you from first-hand experience how they are dealt with. But you can read the theory in the link above. I haven't seen the forged £1.33 stamps but I think that the writer may be referring to the blue(ish) £1.33 English country stamp and not the yellow £1.33 machin. Ah, apologies, yes he did refer to 'English'. I would describe the cooour as mauve/purple but beyond that I hadn't thought of whitish rather than creamish. 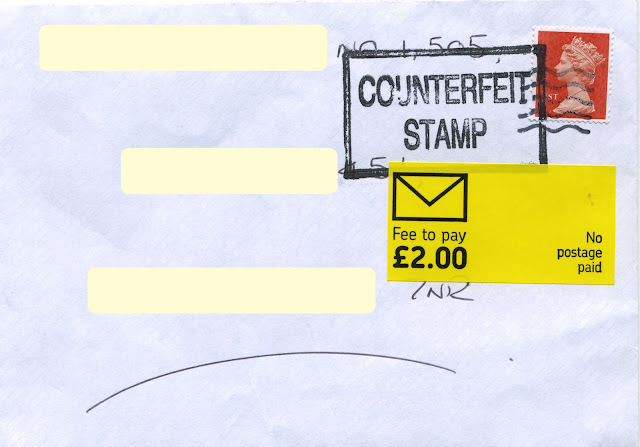 Royal Mail trying to get a grip with forgeries and pre-used stamps. Royal Mail have to take some responsibility for this, they could get their cancelling equipment to cancel more stamps, out of the 7 letters received yesterday (5xDL and 2xA5 size), none were cancelled. They could also crack down on Post Offices wholesale leaking of unused (blank) post & go labels. Can’t help thinking Royal Mail Revenue protection managers would do well to spend a few hours on ebay, delcampe etc. We had a Christmas card withheld and had to pay £2 for its release as the stamp was identified as counterfeit. It was sent by a good friend and I know the stamps were bought in bulk at Costco over a year ago. Is there anywhere I can go for a refund as we believe the stamp to be genuine. I can share a photo if it is of any interest? I won't publish the envelope without obscuring the address. And I'll contact you by email. I just got a message from a customer who got this message on an invoice I sent him , the stamps were bought from a shop post office just a couple of weeks ago! 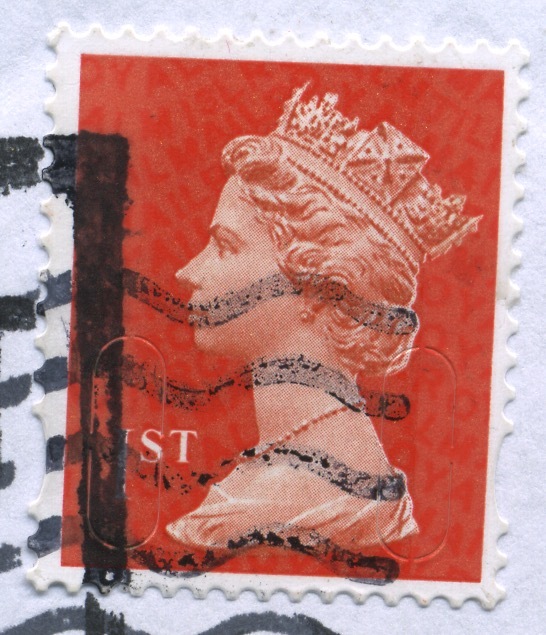 I've recently come across a 2nd class security stamp "MA12" source code which is obviously a fake, as theres a dark blue line around the queen's head, also I think ive got a £1 "shiny" lilac with a similar dark line on the left hand side of the queens portrait, are these common?